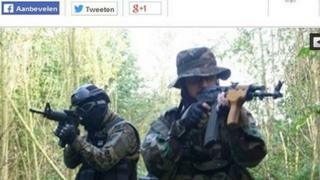 Syria crisis: Welcome to Ardennes - for jihad? Belgium's densely wooded Ardennes region is famous for rivers and mountains - but now it has hit the headlines for a very different reason. The forest, which extends into France and Luxembourg, has allegedly been used for secret training by jihadists, most of them from Brussels. One man who claimed he attended such a camp posted photos on Facebook. The people photographed have camouflage and other military kit, while marching through the woods carrying guns. Most of them have their faces covered. According to Belgian media, police are now investigating. The photos got wide coverage in the Belgian and Dutch media. It's not the first time this has happened: last year there was a report of similar activity in the Ardennes. A police investigation into that found that some of those involved had since gone to fight in Syria. Officials estimate that up to 400 Belgian nationals have travelled to fight in Syria. With a population of just 11 million, Belgium is believed to have the highest number of jihadist recruits per capita of any western European country.